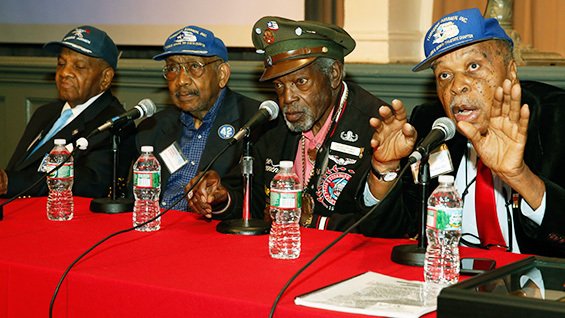 On Thursday, August 7, 2014, continuing its tradition of being a location of civil rights history, the Great Hall held an assembly for four national heroes who fought battles overseas and at home. Three of them, Bill Johnson, Julius Freeman and Dabney Montgomery, were original members of the Tuskegee Airmen, the first African American aviator unit in the military, established during World War 2. The fourth, Richard Braithwaite, served in the navy as the only African American member of the naval aviation test crew during the Second World War. 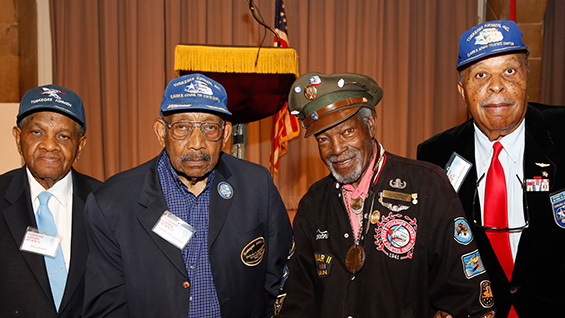 Over the course of two hours the assembled faculty, staff, students and members of the public saw the faces of history as the veterans recalled their struggles in a segregated military and their continued challenges as people of color in post-war America. The event began with a short, introductory film outlining the history of the Tuskegee Airmen, so named for their training facilities in Tuskegee, Alabama. The first African-American aviator units in the U.S. military, they began training in 1941 at a time when the military was still racially segregated. Comprised of a fighter and bombardier group, over 900 men and women trained at Tuskegee. Of those, eventually the fighter group deployed to North Africa and later to Italy. There they earned the "Red Tailed Angels" sobriquet for the red color of their airplane tails and their outstanding record of protecting bomber planes. But the visiting veterans of that pioneering group personally reminded the audience of the significant challenges they faced during and after that experience. "The segregation was tremendous. What I endured was unreal," Julius Freeman, a medical technician at the time, said, recalling his basic training in Texas. Richard Braithwaite recalled that when he joined the navy, "a black man could have a doctorate and the only opportunity that was available for him was as a steward mate [to] wash dishes, shine shoes, serve food, etc." He avoided this fate after doing well on a test and eventually served as part of the grounds crew that tested aircraft before being used. The veterans visited The Cooper Union at the invitation of Henry Rey, who teaches "STEM Takes Flight at Cooper Union," a part of the Summer STEM Program for high school students at the Albert Nerken School of Engineering. "STEM Takes Flight" uses flight simulation stations, on loan from Jay Leboff of Hotseat Chassis, Inc., to teach students the principles of science, technology, engineering and math (STEM for short.) Mr. Rey teaches a similar course at the Frederick Douglas Academy, a prep school in Harlem. 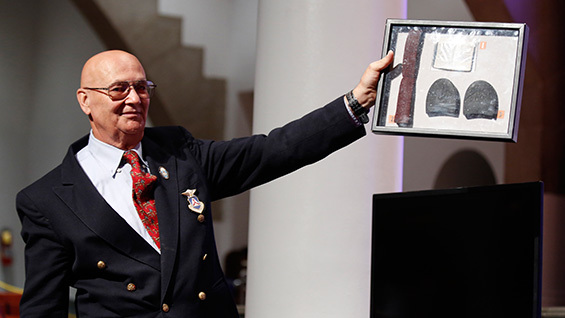 Born in Haiti, Mr. Rey became a pilot in the 1960s and took an interest in the history of the Tuskegee Airmen when he discovered that his godfather was a member. "The Tuskegee Airmen never talked about their experience until about twenty years ago," Mr. Rey said in a conversation before the event. "People started to wonder, 'Why did these guys do everything that they did during the time of racism and Jim Crow and nobody said thank you?' So the US finally woke up to the fact that there were black pilots, black tank commanders, black parachute groups that were purposely ignored by the armed forces." The Airmen were awarded, as a unit, the Congressional Gold Medal, one of the two highest civilian honors granted, in 2007. The four veterans made it clear that their struggle continued after the war as well. Mr. Freeman, who wore a bomber jacket with the Tuskegee Airmen logo on the back, along with a replica of the congressional medal, told of his challenges in breaking the color barrier as a car salesman. Dabney Montgomery told the audience of how, after the war, he went to register to vote in his native state of Alabama and was told, "We have to give you three applications to be filled out by white men. They have to endorse you before you can vote." He found three endorsements and returned to the registration office where, "the lady said, 'The applications are alright but do you own $1000 in property in the state?' " He went on to become Martin Luther King's bodyguard during the Selma to Montgomery march. He kept the soles of the shoes he wore, framed them and brought them to show the audience. Although the story of the Tuskegee Airmen has become better known -- helped by movies such as The Tuskegee Airmen (1995) and Red Tails (2012) -- the veterans showed that their story remains under appreciated. Bill Johnson said that a few years ago he had visited the airfield where they trained. "I visited the site of Tuskegee Army Airfield about four or five years ago and I was really disappointed with what I saw. It was completely erased,” he said. "The only thing that was left was just two runways. It was as if it never existed. I think it was erased because people resented that it was there." He continued, reflecting on the impact of the airmen. "It took sixty years before the accomplishments of the Tuskegee Airmen were recognized," he said, "and it had a major impact on equality here in America. It made America more American. We proved that we are indeed equal.” At the conclusion, the men received a standing ovation.